Ever heard of the saying ‘the golden touch’ (as in, “she has a golden touch, everything always works out for her no matter what”)? One quiet evening King Midas was sitting in his beautiful palace counting his many piles of gold. Suddenly two of his guards burst through the doors and into the room. They were practically out of breath and each one was gripping an arm of a strange looking being, a half-man half-goat creature called a satyr. It only took a second to see why the guards had to grip onto the satyr, the creature was so drunk that another drop of wine would probably make him pass out. The guards quickly explained that they had found the satyr stumbling around the royal rose garden with a jug of wine in his hand and singing loudly to the moon. They wanted to know if King Midas thought the creature should be thrown into a dungeon or simply tossed outside of the city gates. King Midas, however, knew that doing either of those would be a very bad idea. 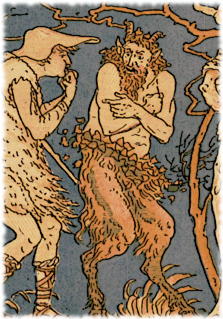 He recognized the satyr as a good friend of Dionysus, the god of wine and chaos. Dionysus wasn’t someone whose bad side you wanted to get on that’s for sure, so King Midas ordered the guards to let the satyr go at once. Silenus replied with a smile and mumbled something about getting lost from his group while they were out partying. Then he stumbled sideways over to a nearby table and fell asleep right on top of it. King Midas was a clever man and realized that he had a chance to make the strange situation with the satyr into a way to earn the favor of Dionysus. And maybe, if he was lucky, he might even get a nice pile of golden coins for his trouble. King Midas wined and dined Silenus, treating him as an honored royal guest for quite some time. Then he personally escorted Silenus on the road back to where Dionysus was holding festivities. Dionysus was so grateful for the return of his beloved friend that he immediately told King Midas he’d grant whatever wish he wanted, no matter what it was. 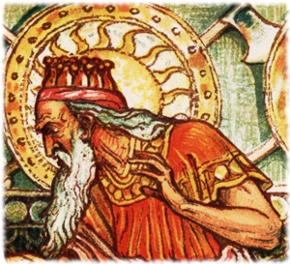 Well King Midas couldn’t believe his incredible luck. His first thought was to wish for a life-sized mountain made from golden coins, but then he had another idea that made his eyes sparkle with excitement. “My wish is for anything I touch to turn into gold,” he said quickly, before Dionysus could change his mind. But King Midas was adamant, what could be better than an endless supply of glittering gold? “So be it,” said Dionysus and granted the wish. King Midas rushed back to the palace to show off his newfound power to the people there. He walked up to a tree in the royal courtyard and touched a branch with his fingers and immediately the entire tree turned to solid gold, leaves and all. He had a marvelous time turning every object in the courtyard into piles of gleaming gold right before the eyes of his astonished subjects, and that night a feast was held in honor of his new abilities. 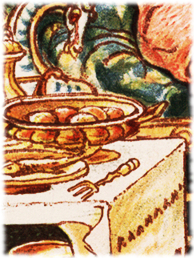 But as he bit down on his food he got a nasty shock on his teeth –the food had turned to solid gold in his hand. Frantically King Midas grabbed portion after portion of food, but each time it turned to gold. He tried to take a drink of wine to calm himself down …but the wine turned to solid gold as soon as it touched his lips. By this time he was in great distress and everybody at the large table was noticing. “I’m going to starve to death!“ he said in exasperation. What happened next changed King Midas’ life forever. Princess Aurelia, wanting to comfort her father, got up from her chair and gave him a reassuring hug. Instantly her entire body was transformed into solid gold. Standing before him, where his daughter used to be, was now a beautiful but lifeless golden statue. King Midas was insane with grief, his lust for gold had taken away the one thing he truly cared about in the world. He knew that his only hope now was to go back to Dionysus and beg to get rid of the golden touch. But when he got there he found that Dionysus did not want to cooperate. “You yourself chose this gift, and now you want to return it?”, said Dionysus raising an eyebrow. 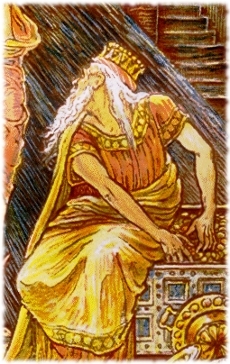 King Midas begged and pleaded, he told the story of what happened to his daughter and how he would trade all the gold in the world to be able to have her back as she used to be. At this Dionysus finally relented. “Go to the river Pactolus and wash yourself in the water. Then all will be as it was before you received your gift,” said Dionysus waving him away. King Midas wasted no time going to the river Pactolus. 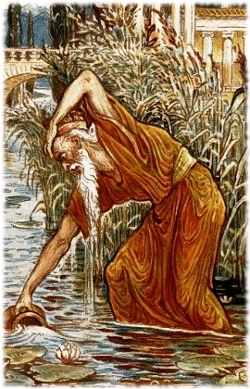 He put his hands in the water and where the river flowed over them there were bright streams of gold. From that day forward the Pactolus river has always had gold mixed in with the sand on it’s riverbanks. More importantly though, the Princess Aurelia was restored to her former self. King Midas was never the same after this experience, now even just the thought of anything gold would make him shudder. He retired from running the kingdom and was often seen walking through the forest admiring the simple pleasures of nature. But his favorite thing to do by far was even more simple: to sit and have a nice dinner …while enjoying every delicious bite of food and sip of wine, with no gold to be seen anywhere. I liked the stories!keep them coming ! Thanks Tanya great to hear that :). New stories coming soon! ANITA U ARE SO SWEET AND UR STORY IS LIKE U.I LIKE UR EVERY STORY.ANITA BUT WHERE U LIVE DEAR TELL ME PLEASE…………………..
Glad you liked the story about King Midas. I live in Alaska. Wow! Great story, just like every other one! Keep writing! Suggestion:Make a horror story of your own. Hey great to hear that you liked the stories :). And yeah I’ll try writing a short horror story and see how it goes. Good to hear! I’ll send more stories soon :). Glad you liked the King Midas story X). Yeah there seems to be a lot of versions of this story out there. Someone even wrote to me and said that they had a book with a version in it where everything turned into chocolate instead of gold.